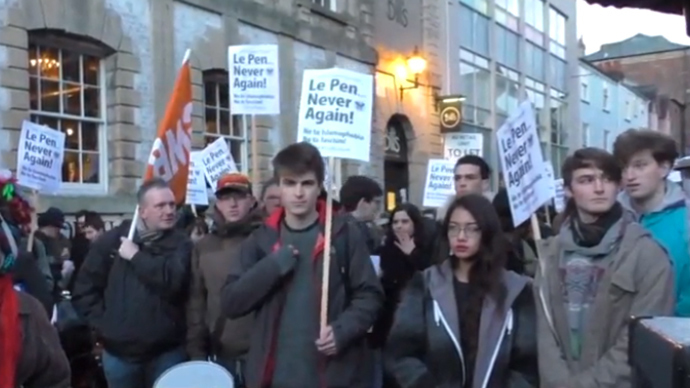 Anti-fascist groups are rallying in Oxford to protest the Oxford Union’s decision to invite Le Front National leader Marine Le Pen to speak on campus. More than 300 people have signed an open letter urging the Union to cancel the event. The controversial far-right leader is due to speak at the illustrious university Union on February 5, much to the disgust of local anti-fascist groups, who have organized a protest rally at Oxford Town Hall. The open letter has garnered support from professors, students, councilors and residents who believe le Pen should not be given a platform. “I urge the Oxford Union to cancel the invitation. Oxford’s tradition of tolerance, racial harmony and internationalism is too precious to be jeopardized by this irresponsible stunt,” he added. Le Pen provoked outrage in early January after using the attacks on the Paris office of satirical magazine Charlie Hebdo to launch attacks on Muslims and immigrants. Le Front National was founded by Le Pen’s father, Jean-Marie Le-Pen, and is the third largest party in France. The party has enjoyed growing support in recent years. It topped the poll in the 2014 European Elections, securing 25 percent of the vote. Tracy Walsh of the UAF’s Oxford branch pledged that while excluded from the Oxford Union, they would still oppose Le Pen’s appearance. “UAF has organized a rally this week and a demonstration on the night of her speech to make sure our voices are heard loud and clear – Marine Le Pen is a fascist and is not welcome here,” she added. The Oxford Union previously told the Daily Mail they didn’t have an agenda, but were firmly committed to the principle of free speech. “An invitation from the Union is not an endorsement of any particular agenda,” said the term’s Union chair, Lisa Wehden. “The Union believes in the principle of freedom of speech and we would encourage all members who disagree with an invited speakers view to attend the event and question the speaker. We allow our members to meet people face-to-face and make their own minds up,” she added. Approached by RT, the Union refused to provide any additional comment.